From now on, every day that I wake up and the sun is shining, I'm going to think about how I can entertain Scott Mersiowsky. If I can't give him something to think about every day of the week, I'll consider my time on this planet wasted. With that in mind, it was cold and windy today. I was not happy. It took about 15 minutes before my hands weren't frozen, and I was wearing gloves. I need to find my hat and start wearing that. Somehow Justin managed to take his gloves off at the end, but maybe it's because he had on under armor. I don't know how he did it. Bob, Scott, Jack, Justin and I went out to do parts of the half-marathon course for next week. Justin led the way since we "didn't know the course." We almost got lost while he peed on a historical monument. Running into the wind was brutal. I wanted to quit. We talked about all sorts of things... our feelings, rainbows, butterflies, kittens. It was a real heart-warming run. 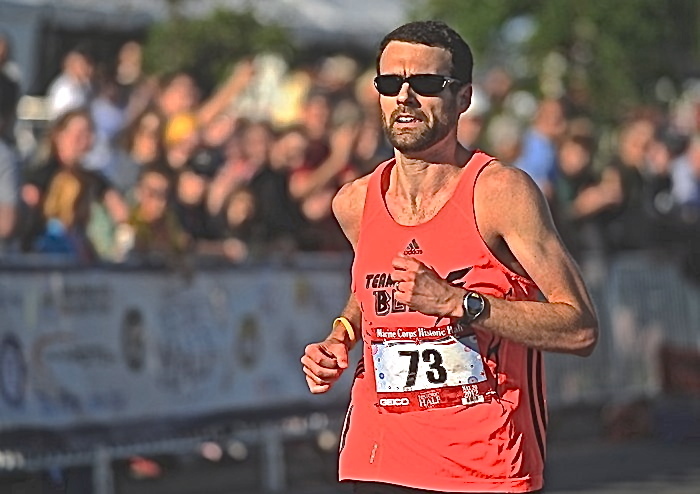 We pondered over Matt Boyd's eternal struggle to be the best runner in the area but still being over 40 years old. There was a lot of conversation about the "Big 3" from the 2000 Foot Locker Cross Country Championships-- Dathan Ritzenhein, Alan Webb, and Ryan Hall. That was entertaining for me. I'm not sure whose career I'd rather have. It's been a roller coaster for all three of them, and they've all accomplished so much. Each has been an American Record holder (though Ritz has lost his.) Each has been to the Olympics, each has had highly publicized and criticized coaching changes. No one quite had the college career that was expected of them. But they are the present and the future of American distance running 10 years later, so that's pretty sweet. Bob and Jack turned back in the middle of the hill up Cowan, while the rest of us went on to VA Runner and back. Justin and I debated the merits of hill workouts and track workouts, and then discussed which one of us suffered a greater loss by taking days off fro work. I felt awful for the last half of the run. I was cold and my stomach was cramping up because I'm too dehydrated all the time. If I don't stay hydrated this week, I probably won't be able to finish the half-marathon next week. 44 miles for the week. Mileage for October to today, including Twin Cities: 55, 32, 60, 37, 47, 45, 41, 34, 37, 44. 6 runs in 5 days, which includes running club. Not exactly training for a half-marathon.